I am planning to retire in January of next year. I have recently received notice to renew my coverage. What insurance coverage will be in place when I retire? If you plan to retire effective January 1, you should complete an Application for Exemption, not an insurance renewal application. However, if your retirement will be effective part-way through the POLICY year (i.e., any date subsequent to January 1), please complete and file the Application Form. Notify LAWPRO in writing or via e-mail ([email protected]) about your pending retirement. 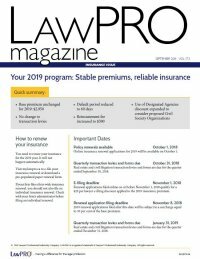 You will be reimbursed any insurance premiums prorated to the actual date of your retirement, subject to a minimum two-month premium and limited to the 30-day period immediately preceding LAWPRO’s receipt of your written notice. For those carrying the Real Estate Practice Coverage option, we are not able to backdate for this 30-day period. I am retiring from the active practice of law in the next few months and am thinking about purchasing additional insurance when I retire. How do I do that? LAWYERS who retire from the active practice of law may apply for exemption by submitting an Application for Exemption. When on exemption you are provided with Run-Off coverage of $250,000 per CLAIM and in the aggregate for free, subject to a $5,000 DEDUCTIBLE per CLAIM. This is Run-Off coverage is not reinstated annually, but rather is a one-time limit. This Run-Off Coverage applies to CLAIMS arising out of PROFESSIONAL SERVICES provided while you were in private practice or otherwise maintained the practice coverage under primary LSO program. This Run-Off Coverage does not, however, cover CLAIMS arising out of PROFESSIONAL SERVICES that you provided while on exemption under the program. The only exceptions to this are with respect to pro bono PROFESSIONAL SERVICES provided through Pro Bono Ontario and where you have applied for and purchased additional coverage for certain ongoing services as estate trustee, trustee for inter vivos trust, or attorney for property (see exemption “h” in the Rules of Exemption Eligibility). You may apply to increase your Run-Off coverage limits. For further details, refer to the Insurance Matters for Retired Lawyers booklet which provides more detail regarding the Run-Off coverage, as well as answers to questions about exposures that may arise out of your past practice. For a no-obligation estimate, please complete and submit an Application to Increase Run-Off coverage. Please note that this additional limit protection only comes into effect a minimum of 60 days following receipt of your written confirmation to purchase this coverage. I am thinking about retiring from the practice of law. I have provided several expert opinions on various matters on which I may be called to provide expert testimony on after retirement. Do I need to continue carrying coverage? In our view, providing expert opinions on law-related matters is in fact the practice of law, so you would be required to maintain the practice coverage under the primary LSO program when providing such an opinion. If you were to provide such an opinion before your retirement and were only to provide expert testimony on such opinion after retirement, however, there would be no requirement that you maintain the practice coverage when providing testimony. Of course, nothing is ever quite so simple. If you were asked to update, amend or provide supplemental opinions or comments, or were asked as a witness to expand on your opinion, this would constitute PROFESSIONAL SERVICES, so practice coverage under the program would then need to be put in place during that period of time.